This observation originally arose from watching what happened when I asked people to tell me stories, both in what they said and their body language (when I could see it). People veer off into one or more of several predictable trajectories at the mention of the word "story." I've been amazed by the consistency in the responses I've seen. People even use the same words even though they have never heard other people use them. I have found this to be true whether I am talking with people face to face, on the phone, in groups, or over the web. Over time I've developed a sort of map of the universe of what people think stories are and do, and I've found it has uses at different levels. 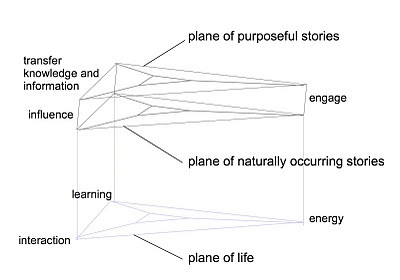 First, here are categories of responses I've seen to the word "story" mapped in relation to three functions stories provide: they engage our attention, they influence our beliefs or actions, and they transfer knowledge and information. Note that some types of story involve more than one function. A lesson engages and informs; a performance influences and engages; an opinion influences and informs. Fables (folk tales) are the most powerful and adaptable stories because they include all three elements. This next triangle shows paraphrases of some of the things I've heard people say in story collection workshops and what that indicates they were thinking I meant when I said "story." 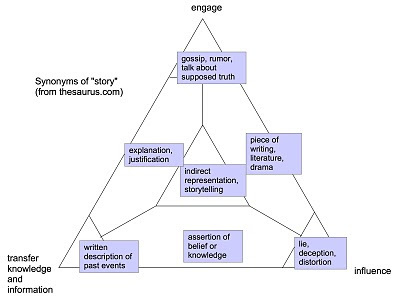 This triangle shows the same divisions but with synonyms of the word "story" I found on thesaurus.com. I thought at first while doing this little thesaurus exercise that there was nothing in the "joke" spot. But soon I realized that stories as gossip and rumor fit well there, because they engage people in connecting with emotional resonance on issues that are difficult to talk about. In that sense jokes, gossip and rumors are all methods of oblique emotional engagement through stories. You can envision two copies of this triangular model occupying two parallel planes: the plane of naturally occurring stories and the plane of purposeful stories. And then you can envision another triangular plane beneath: the plane of life itself (which is of course why we tell stories in the first place). People, and groups of people, need to maintain energy, interact with other people and groups, and learn from experience to better survive and thrive. Purposeful stories, on the other hand, are like domesticated animals. The purpose of a domesticated chicken is so strong that the chicken is unable to survive in the wild. The function of a purposeful story, or its place on the triangle, is designed in advance. But the function of a naturally occurring story - if it has one - becomes apparent only after it has been told. When we shape a naturally occurring story to fit our needs, we are essentially domesticating it to suit a purpose. We do this naturally and without realizing it all the time. We encounter many wild stories every day, but we select some to tame based on needs we may only be vaguely aware of (or may deny). For example, the first time little Joey says "dog," one parent will tell the other simply because it happened. The second time Joey's parent tells the story to a neighbor, they might add some details that emphasize how precocious little Joey is. By the time little Joey is a dog trainer with a syndicated TV show, the story may have grown to an elaborate fantasy about how Joey had a precocious empathy with dogs never seen before or since - a full-blown purposeful fable. I'm sure someone will be saying here that there are no completely purpose-less stories, that even the shyest of wild stories has some purpose whether we admit it or not. I agree, and that is why I drew a center region on the model instead of a center point, because the center point is theoretical and probably never seen in real human conversation. 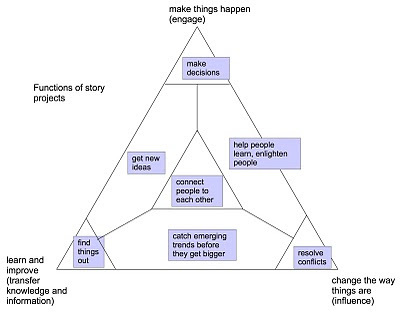 My final triangle shows the same functions, but this time they apply to projects in which stories are collected. Story engagement maps onto using stories that engage the world by making things happen. Story influence maps onto using stories to change an existing situation. Knowledge and information transfer using stories maps onto using stories to discover and explore. Here I've taken the "Things you can do" headings in the What is working with stories page from WWS and placed them on the triangle. It is interesting, first, that the project categories from the book map so well and completely onto the triangle. It is also interesting that only one category maps into the center region: that of connecting people without any other purpose. As with stories, story projects exist at two levels. Some story projects are highly purposeful in that they have predefined goals, but others are wild in the sense that the goal is only to collect some stories and see what comes of it. Neither is better, but they are different. When you ask people to tell you stories, they will almost always move away from what you want them to do in two predictable ways. First, they will float up from the natural plane to the purposeful plane. Second, they will move towards one or two of the triangle vertices. Why keep people in the middle of the natural plane of storytelling? Because for story listening to lead to useful outcomes, it requires the authenticity of wild stories. As soon as a wild story is given a purpose (usually through what people think you want them to do) it becomes a purposeful story and authenticity dissipates. Authenticity is the essence of story listening. It is what separates the approach from focus groups and surveys, which are soaked in purpose. For the best story listening, you need to keep people both on the natural plane and in the middle region of the triangle until after the story has been told. Afterwards, when you ask people to answer questions about their stories, they can place the stories precisely in the triangle. Such placement does give both storyteller and listener valuable understandings about the story, but it must be done at the right time. In fact, telling people that they will have a chance to describe and explain their story afterward helps them keep the story in the center, because it allows them to tell it without explanatory purpose. So if you are asking questions about stories, let people know. How can you keep people in the middle of the natural storytelling plane? With preparation and practice. When you are collecting stories in interviews or group sessions, pay attention to which vertices of the triangle people seem to be attracted to, and adjust your approach. Such attractions will vary both by individual personality and by group culture. Engineers tend to be drawn to the information-transfer vertex, while performers gravitate to engagement and salespeople to influence. The better you get at recognizing deviations from the center of the natural plane, the easier you will find it to help people return there. Creating such a balance communicates freedom from a single purpose. It also creates a downward motion through its emphasis on what actually happened to the teller. But having said that, if your project is heavily invested in one of the triangle vertices, it is reasonable to include a question that deliberately guides people toward a purpose. However, understand that you will not be collecting naturally occurring stories when you do this. The stories will be crafted for the purpose of performing to the specifications you have outlined. Sometimes you do want this purpose and should accept it. However, I usually suggest that every vertex-pointing question be offset with a centering question. Why? Because one of the reasons you are collecting stories in the first place is to find out things you cannot possibly guess in advance. The more you corral stories into one location, the greater your danger of missing useful patterns and trends in unexpected locations where you have not have the foresight to look. 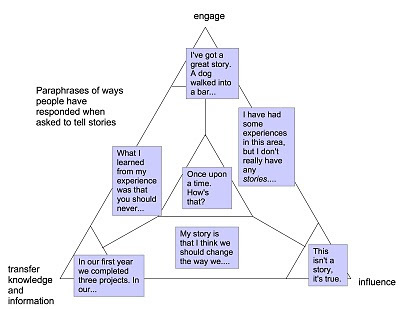 At the story project level, the triangle model is useful in three ways. It can help you figure out your goals; it can help you plan your project; and it can help you explain the project to other people. You can use the diagram is to create a triangular portrait of your project's goals and motivations, with some areas lit up and others dark. One way to fill out the triangle is to tell two purposeful future histories about your project before it starts: the best outcome and the worst outcome. In the best outcome, which of the areas of the triangle are most prominent? Do you find things out? Do you get new ideas? And then in the worst outcome, which areas are missing or go badly? Do you fail to resolve conflicts? Do you find it impossible to make decisions or choose between options? By doing this you can find out which areas matter the most to you, and you might be surprised by what you find. Once you understand your motivations in doing the project, you can use the diagram to plan how you will carry it out. 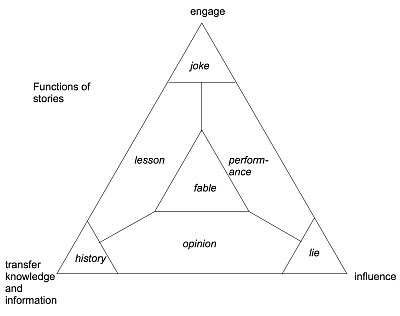 Recall earlier that I cautioned against story elicitation questions that lead people into one of the triangle vertices. There are ways to design your project towards a goal without leading people into a vertex in their storytelling, by carefully selecting how you collect stories (but not what questions you ask). If you need to tap into engagement in order to prioritize and make decisions, choose methods that draw out energy and emotion, like storytelling exercises or face-to-face interviews. If you need to tap into influence in order to understand conflicts and problems, choose methods that draw out conflicting perspectives, like asking different groups of people to answer the same questions or do the same sense-making exercises. If you need to tap into knowledge transfer in order to find things out, choose methods that encourage detailed description. Ask people to tell you about the items on their desk or have people build complex timelines of the events in a field or career. For engagement, pay special attention to words that evoke emotional expression. For example, a question about the time a person felt especially happy or sad or angry would convey that emphasis. For influence, favor words that ask people to repond from a particular perspective. A question about a time people were surprised, or disagreed, or felt misunderstood or alone or unique would tap into perspective-based stories. For knowledge transfer, communicate an attention to learning and discovery. A question about a time when something suddenly became apparent would bring out learning stories. Finally, the triangle model is useful in getting "buy in" from people whose support you need to complete the project. 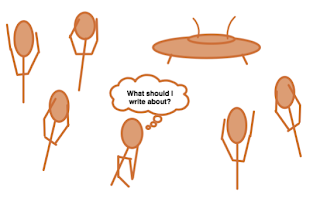 A common problem with getting people to help you (or let you) do story projects is that they misunderstand what you are trying to do, what will happen, and what will be the result of the project. I've seen several projects die because their instigators were unable to communicate to those in charge (of money or permission) what they wanted to do. Or more likely, the instigators were unable to stop those in charge from jumping to erroneous conclusions about what the project was about. In the same way that people rush to a vertex or side of the triangle when you ask them to tell stories, people rush to conclusions when you describe a story project. Maybe you want to help people transfer knowledge using stories, and people think you want to make dangerous changes to corporate culture. Or you want to find stories that engage people, and they think you want to collect personal information. Or you want to do a naturally centered story project, one that collects stories without preordaining what you will get from them, and they want to push you into collecting only "compelling" stories or "the best" stories. You can use the triangle model to plan how you will communicate to people - funders, collaborators, management - about the project itself. You don't have to show people the diagram, but using it can help you to craft a story about how your project will proceed, so that you can convince them to help you or let you carry it out. It can also help you think about how people might respond and plan for it. For example, if you want to do a centered project, you might prepare a plan for guiding perceptions at each vertex (oh, that's just project planning; oh, that's just marketing and sales; oh, that's just KM) back to a more balanced perception of what you plan to do and why. This observation is about the career-changing discovery I encountered during my first few years of work in organizational narrative: that true, raw, real stories of personal experience are more useful for almost every task you can imagine than are stories of pure fiction. In the few cases where fictional stories are preferable as the end result, considering true stories will create a far more effective fiction than creating one from whole cloth (if that is even possible). I've written elsewhere about the story of this discovery and how it influenced my later work in the field. In the years since I first encountered this discovery, I have often thought about it. Not about the discovery itself, which I have seen played out so many times that it has reached the level of a natural law in my mind. But I can't help thinking often about the imbalance between this natural law and what I see people doing and wanting to do in this field. And I keep asking myself the same questions. Why do people call a field in which organizations do many different things related to stories "organizational story telling?" Why is the side that helps people craft fictional stories so much more prominent and noticeable than the side that helps people listen to raw, personal, true stories? Why are there so many more people and groups and books and programs on the telling side? Why have I seen so many people - clients, researchers, consultants, practitioners - start their journey through organizational narrative on the telling side? Why have I heard the same starting-with-the-telling story from several other people who work in this field? Why does it so often require a striking revelation such as the one I had to understand that listening to stories is at least as useful as telling them? Why did it take me over a year to come to this realization? What was I doing before that? What was I thinking? Why didn't I see it sooner? What made me assume that telling stories would be the best way to address all manner of organizational goals? It's almost like the telling side stood in front of the listening side, obscuring it, outshining it, blotting it out. Why? Two points before I move on here. First, I want to make it clear that I am not saying anything against the telling side of organizational narrative. I work on the listening side because I think it has more power to produce positive change, and probably because it fits my scientific background better. But I also respect work on the telling side, as long as it is done with integrity. I especially respect those who span all areas of story work, because the two sides should complement and help each other. The trends I am pondering are not about whether all the parts of the organizational story puzzle should exist, but about the imbalance I see in the sizes of the pieces. I also realize not everyone reading this post will agree with my "natural law." I have seen evidence for truth being more useful than fiction in dozens of projects, but that evidence is not always easy to communicate (though I have tried). If you can meet me halfway and concede that the truth is at least as useful as fiction for most things, read on. To tell the truth, I didn't write the observation "truth is more useful than fiction" on the day I made my big discovery about stories. What I really thought of was this old television commercial. Madge: [to client] When I see your hands, I wish I were a nurse. Madge: Ever try Palmolive dish washing detergent? Softens your hands while you do the dishes. Madge: You're soaking in it. Client: The dishing washing liquid? Madge: Oh, more than just mild. Announcer: Right, Madge. 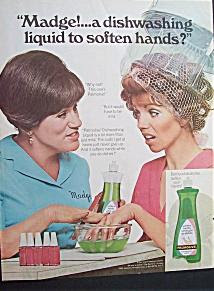 Palmolive lasts from the first glass to last grease casserole. And it softens hands while you do dishes. Client: [Two weeks later] Madge, that Palmolive liquid of yours, I'm simply in love with it. When I sat at my desk juxtaposing my failures to write resonant fictional stories with the amazingly rich true stories people had told me, I thought, "I'm soaking in stories and don't know it." Coming back to it years later, that silly old commercial is a perfect metaphor for listening to stories, because washing dishes is just the sort of mundane thing people don't want to do, but that gets surprisingly good results. But ... I was too underconfident to use Madge for my presentation, so I came up with "truth is more useful than fiction" instead, as a play on the old joke "truth is stranger than fiction." Truth is more what than fiction? When I revisited this observation for this blog post, I thought I should look into where the truth-fiction joke came from and how it is used. Intrigued by this proverb and remembering my change to it, I tried a little experiment. I typed "truth than fiction" into Google. In the 847 results (page titles and snippets), I noted every word used in the "X" place in the phrase "truth is X than fiction." This journey through the hinterlands of Google constituted an unscientific sampling of the ways people talk about truth and fiction. From the 847 results I found 39 words or phrases in the "X" spot. Then I clustered the 39 words into four groups, which I'll explain here. So far so good, right? Hang on. We may see the world through rose-colored glasses, but rose-colored glasses are neither opaque nor clear. They can't be opaque because we need to see the world clearly enough to participate in it -- to pilot helicopters, harvest corn, diaper babies, and all the other stuff that smart mammals need to do in order to survive and thrive. But they can't be clear because we need their rosy tint to motivate us to design the helicopters ("I'm sure this thing will fly"), plant the corn ("This year will be a banner crop"), and tolerate the babies ("what a bundle of joy!"). We cannot do without reality and we cannot do without illusion. Each serves a purpose, each imposes a limit on the influence of the other, and our experience of the world is the artful compromise that these tough competitors negotiate. This is exactly the function of story listening: to learn just enough about what is good and bad about our situation to do something about it. When stories are only used for telling, there is a danger of defending oneself so well that an auto-immune disorder develops. Selective collection of evidence comes in when people ask the wrong people the wrong questions at the wrong times and in the wrong ways, making sure that they will avoid collecting stories that challenge their beliefs. Selective interpretation of evidence comes in when people fight with the stories they have collected or disqualify stories or storytellers. Selective recall of evidence comes in when people collect and confront stories, but process them in a way that reduces the outcome of the story project or hides its result so that it will be quickly forgotten. When I consider this, I stop wondering that listening to stories is not more prominent and begin to be amazed that anybody is doing it. This makes me think of the same psychological immune function operating at the group level. It points to common biases such as in-group bias (those people can't have anything useful to say), out-group homogeneity bias (there are no nuances to what those people think), and the group attribution error (those people are the way they are because they are that way; there is no point finding out why). When this immune system is working well, it should let in just enough of the "other" to be useful without endangering group identity and coherence. However, such protections can be too strong for our own good. Notice how many of the "truth is foreign" descriptors have to do with social status. (Look again at the disgust on the woman's face as she finds out she is soaking in lowly dishwashing liquid. And how Madge gently but firmly pushes her hands back into it.) Is it possible that people don't want to hear stories about people beneath them in the social order because they fear it will drag them down by association? According to social comparison theory, people prefer to compare themselves upwards rather than downwards in the social order. In that light it is interesting that packaged fiction created for the purposes of advertising and entertainment tends to reinforce upward social comparison. The famous example of the people on the sitcom Friends having an apartment that would cost far more than their meagre salaries is only one of many such upward comparison forces. ... present evidence indicating that the effect of income on both life and ﬁnancial satisfaction is signiﬁcantly smaller for heavy television viewers, relative to occasional viewers. In other words, the more television you watch, the less satisfied you are with your income. I wonder what would happen if the reverse study was conducted: would people who are regularly exposed to non-fictional, raw stories of personal experience told by those with lower socioeconomic status experience a lower correlation between income and happiness? My guess is that these have partly to do with the phenomenon of the supernormal stimulus, or, our being evolutionarily unprepared for the scope and size of current stimuli. For tens of thousands of years people told stories around quiet campfires without the aid of Hollywood special effects and wall-sized enlargements of everyday sights. There is a famous story that during an early motion picture screening, of L'Arrivée d'un train en gare de La Ciotat in 1896, members of the audience screamed and attempted to get away from the train that was apparently heading straight at them. It is unclear whether this really happened or whether the reaction was to an early 3D film with the same subject. But in either case, if you compare this reaction to the blasé reactions of people today to scenes of giant spaceships descending and the like (even in today's 3D movies), it is clear that our expectations about the presentation of fictional stories have been radically transformed. Compared to this level of impact, simple anecdotes told by regular people seem so inconsequential as to almost fade from existence. They are like small eggs abandoned by their mothers who instead incubate the larger eggs left by parasitic cowbirds. Maybe this also explains why people want to collect so many stories: they are trying to replace size with volume. Another issue is that long ago, people rarely heard true stories about people outside their village or tribe. Most people have heard about Dunbar's number, which is essentially the maximum number of people we can keep track of being related to. This number is generally reported to be around 150 people, though depending on the circumstances it can be larger or smaller. So, there is another possible clue to the puzzle: maybe listening to the personal experiences of people outside the normal scope of village life requires an artificially enlarged scope of connectedness for which people are ill prepared. A drama consisting of a genuine slice of life, unedited, would be unlikely to be very interesting. The reason is that conversations are only interesting to the extent that you know about the individuals involved and your social world is bound into theirs; as their distance from you increases, the interest level declines. Given that dramatic characters are usually strangers to us, then, the conversation will have to be unusually interesting to hold our attention. That is, the drama has to be an intensified version of the concerns of ordinary conversation. By this account, fiction is exciting because it has to be to get you to engage in paying attention to the experiences of people you don't know. If that is true, then it can be no surprise that listening to raw, personal stories told by people whose experience you need to know about but who have no close relationship to you may take conscious effort. This is yet another reason to be amazed that anybody is listening to real stories. As I consider these explanations, the image I keep seeing is that point in The Empire Strikes Back where Luke has to fight Vader/himself in the cave. of evil it is. In you must go. spins and bounces, smashes on the floor, and finally stops. For an instant it rests on the floor, then it cracks vertically. The black helmet and breath mask fall away to reveal... Luke's head. When we listen to stories about ourselves or about things we care about, we enter a dark cave and find ourselves waiting, cloaked in our deepest fears. Luke took his weapon into the cave, but it did not help him; it only hindered his exploration. The same thing happens when people fight with the stories they find in their caves. Let me stop a moment. I feel that I am in danger of sounding like I believe that people who tell stories or work on the telling side of organizational narrative are afraid of listening to stories, or biased or bigoted or self-deluded. That's not what I'm trying to say. My guess is that people either don't see that listening to stories could be helpful to their task, or they do see it but dismiss it because of the dangers it presents. And it is as dangerous as it is helpful. Listening to stories is a knife with no handle. It reveals; it teaches; it provides; but it cuts. Nobody in their right mind would reach for such a knife, unless they know it can bring them something that nothing else can. Finding out what listening to stories and working with stories can bring to a task requires putting aside, for a while, some of the instinctual protections that keep us safe. As I think about this, I also begin to understand more about why people sabotage their own projects. It may be simply inevitable. It also becomes more clear why outsiders like Yoda can help people limit their self-sabotage. Yoda is not threatened by confronting Luke's deepest fears. It's not his cave. The other thing Yoda gives to Luke is his experience in having entered and exited his own cave of self-discovery unscathed and enlightened, and having seen other people do this as well. Yoda is on the other side of the experience. He knows what Luke has not yet done, so he can give Luke the quiet confidence he needs to enter his cave. I've found this to be true in story projects as well. People are helped by hearing about other story projects as they start their own. Listening to true stories and building fictional stories are both activities that involve narrative, but they are fundamentally different activities with respect to the way people have lived for many thousands of years. Building fictional stories is a form of play, while listening to true stories is an activity of information gathering. These are different contexts with different rules. All participants must understand behaviors like chasing and rough-and-tumble as play and not real attack. To initiate play, canids have a ritualized play bow, particularly stereotyped in the young, like the "Once upon a time" that signals to a human child a partial suspension of the rules of the real.... Play constitutes a first decoupling of the real, detaching aggression or any other "serious" behavior from its painful consequence so as to explore and master the possibilities of attack and defense. In play we act as if within quotation marks, as if these were hooks to lift the behavior from its context to let us turn it around for inspection. During a visit to the National Fire Academy we met with one of the senior developers of training programs. In the middle of the meeting, the man stood up, walked over to the door, and closed it. Then in a hushed voice he said, "To be a good fireground commander, you need to have a rich fantasy life." He was referring to the ability to use the imagination, to imagine how the fire got started, how it was going to continue spreading, or what would happen using a new procedure. A commander who cannot imagine these things is in trouble. Why did the developer close the door before he revealed this ability? Because the idea of using fantasy as a source of power is as embarassing as the idea of using intuition as a source of power. He was using the term fantasy to refer to a heuristic strategy decision researchers call mental simulation, that is, the ability to imagine people and objects consciously and to transfrom those people and objects through several transitions, finally picturing them in a different way than at the start. This process is not just building a static snapshot. Rather, it is building a sequence of snapshots to play out and observe what occurs. Maybe one of the reasons truth is scarier and more frighteningly foreign than fiction is that it is not play. Play suspends the dangers of attack and defense, of us and not-us, of near and far, of big and small. Listening to other people talk about their real experiences, when they are not in the groups we are instinctively attuned to gathering information about, pushes all of our danger buttons. It feels like going into a dark cave without any defenses. But when we work with the same stories in a sensemaking session, we bring them out of the cave and into the context of play, where the "rules of the real" are partially suspended. We select elements to cluster, build personifications, put events on timelines, and construct elaborate fictional stories using factual elements. These activities, like the firefighter's "fantasy," produce real and substantial benefits. Like a firefighter, an organization that cannot imagine these things is in trouble. What does all of this mean to people actually trying to work with stories? I think we can draw a few recommendations from these thoughts, both for people doing story projects in their own organizations and communities and for people helping them do that. First, be aware of the dangers of story listening. Become familiar with them. Why? Because the less you know about the cave the more vulnerable you will be to its dangers. Start with small projects so you can build your skill at entering the cave and confronting yourself without carrying weapons that reduce the value of the effort. Second, bring Yoda with you to the mouth of the cave. Have someone unconnected to your identity participate in your story project. They don't have to be a consultant; they can be your next-door neighbor or your grandmother. Run your questions by them. Read them some of the stories you heard. Show them the patterns you think you see. Let them help you stop fighting your own goals. Third, bring play into your story work as often and as soon as possible. For example, in a sensemaking session, don't just throw stories at people; have them start playing with them right away. Get them building things while they are absorbing stories, not afterward. Keep people, and keep yourself, in the context of play so that you can use the "partial suspension of the rules of the real" to your advantage. Fourth, don't let play destroy the information gathering aspect of the effort. Don't delude yourself into thinking you have gone into the cave when you haven't. And don't bring play into the cave. In the context of the cave, play is like Luke's weapon: he wanted it for safety, but it diminished the cave's value along with its danger. In story work, you are likely to catch yourself sending subtle signals in your questions for and about stories that limit or direct the information you gather to what is safest. This reduces the power of information gathering. Everybody does this (myself included) and everybody needs help with it. People say "tell us your success story" or "talk about your best moment." Or they give an example that suggests safety is desired. These and other play-bow signals are elements of play that don't belong in the cave. Productive play cannot happen without productive material, and to get productive material you need to go into the cave without carrying the protection of play with you. In poking through the dregs of Google for things people said about truth and fiction, I found many related quotes. I noted these as well, and trimmed the list down to these three, which considering the explorations above, seem perfectly prescient. Why did she feel it was necessary to write "say it" twice? Doesn't that seem to point to something that everybody knows but nobody will admit? Could it be that she felt people don't want to know that the universe is made of stories? It's a thought.